Peel and chop garlic. Trim ends of baby bok choy, then halve. Wash shrimp and remove peel. Rinse basmati rice under clear water. Heat oil in a large saucepan over medium heat and add rice. Fry for approx. 2 – 3 min. until translucent. Deglaze with coconut milk and water. Season with sugar and salt to taste and bring to a boil. Turn off heat, leaving the saucepan on the stove. Cover with lid and let steam for approx. 10 min. When rice is done, stir, place a clean kitchen towel in between saucepan and lid, and let sit for approx. 5 min. Heat oil in a large frying pan set over medium-low heat. Fry half of the chopped garlic for approx. 1 – 2 min., then add baby bok choy. Season with salt and pepper. Deglaze with vegetable stock and cover pan with lid. Cook for approx. 3 – 4 min. or until bok choy is soft but firm to the bite. Heat oil in a a second frying pan over medium heat and fry remaining garlic for approx. 1 – 2 min. Add shrimp to pan and season with salt and pepper. Reduce heat to medium-low and fry shrimp on both sides for approx. 15 sec. Deglaze with lemon juice. 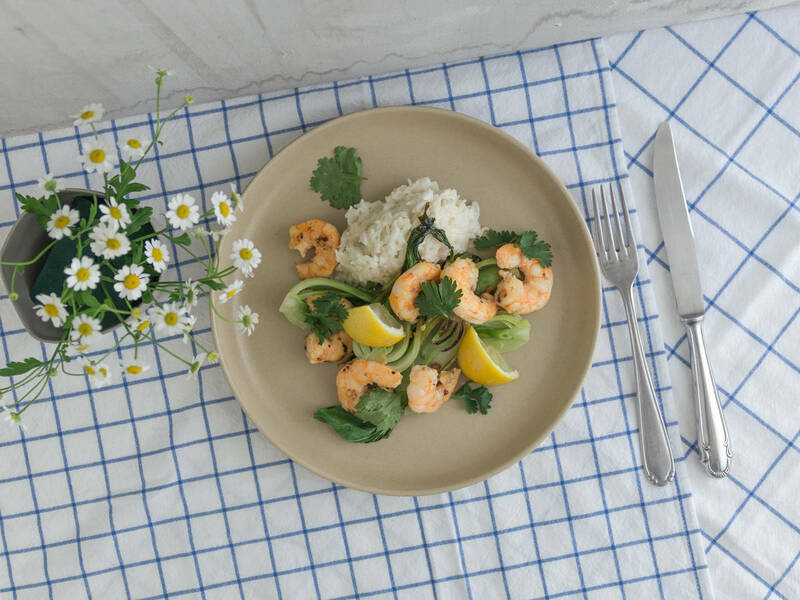 Serve shrimp with coconut rice and baby bok choy. Enjoy!